The next big thing in TVs is 3D. And now that a standard has been set, all the big brands—Panasonic, Sharp, Sony, Toshiba, Mitsubishi, to name several—were showing off their sets at this year’s CEATEC, the Japanese electronics show (CEATEC is always a good barometer of what we’ll see in the U.S. the next year). In the real world, our brain interprets three dimensions using the slightly different perspectives being received by our left and right eyes. The brain fuses these two images together to create our perception of a three dimensional image. 3D TVs use technology to mimics this effect—causing your left eye to see something different from your right eye and "cheating" your brain into thinking it's receiving information from a three dimensional image. The 3D TV you’ll have in your home uses the same technology as is currently being used for most 3D movies in theaters. Special glasses receive a signal from the TV to, in essence, cover up either your right or left eye. The transition happens so quickly, you shouldn’t notice it. The result is an amazing perception of depth that goes far beyond the old "red and blue" glasses used in prior decades. 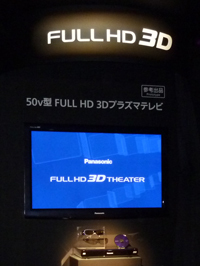 It's important to note that just as HDTVs need an HD source, 3D TVs will need a 3D source. In the near-term, the only option will be a 3D-capable Blu-ray player. Cable and satellite are expected to follow shortly. There is no broadcast standard for 3D TV and over-the-air broadcasts aren't expected for a few years. 3D can count me in.